The Monaco Grand Prix is perhaps the most iconic Formula 1 race on the calendar. It has been run on the streets of the principality since 1929, and still attracts a lot of attention from the rich and famous. 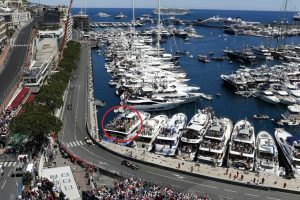 During the race weekend, the marina is jam-packed with luxury yachts, which offers a unique vantage point on the race action. The first race was organised through the Automobile Club de Monaco by Antony Noghès, a Monegasque citizen, in 1929. This idea was proposed in order to upgrade the club to a full national status from that of a regional French club. The first race was won by William Grover-Williams, who was driving a Bugatti. This race became a part of the Formula 1 championship for the first time in 1950. The first winner of this World Championship race was Juan Manuel Fangio, who scored his first World Championship win, before eventually winning five world championships. The race has been a permanent fixture as part of the Formula One World Championship since 1955, taking place every year. Juan Manuel Fangio became the first person to win the race a second time in 1957. Graham Hill, however, went on to become the most successful driver on the circuit in the 1960s, winning the race five times. This feat earned him the monikers “King of Monaco” and “Mr. Monaco”. Following an era in racing notorious for the frequency of fatal accidents, Jackie Stewart led calls for improvements on safety at Monaco and other circuits. This led to the installation of Armco barriers in 1969, followed by other changes and safety improvements. Due to the tight corners around the streets of the city, the racetrack has one of the slowest average speeds on the F1 calendar. Nelson Piquet, who hated the circuit, famously likened it to “riding a bicycle around your living room”.